Security guard company patrol software doesn’t need to be complicated. As a matter of fact, officer management should be simplified and streamlined with quality guard company patrol software. The issue has been that software companies, with little or no experience in the security guard business, have developed tracking software that they—the techies—consider nifty, whether the GPS guard tracking uses tons of data and drains your battery or not. That’s not good and that’s NOT the case with GuardMetrics guard patrol software. Our team has decades of experience in the security officer patrol and management field and has developed the GuardMetrics guard company patrol software to be as easy, yet capable, as possible. This mobile guard patrol app is able to run on iPhones, Androids, Window phones; any smart-device. And, despite the detailed reporting features, including pictures and video, the data usage is in the realm of a text! So you can even have your officers load the patrol app on their personal mobile phones and it won’t cost them in data or battery life! Call GuardMetrics to experience how simple, yet effective, security guard company patrol software should be. What is amazing—and troublesome—is how over-complicated many guard patrol software systems have become, even when some of the owners initially came from the security officer industry! And the more complicated the GPS patrol tracking solution, the more difficult it is to fix the bugs; example: One of the biggest players in the guard company patrol tracking software space can’t even take pictures in the field to attach to the report after the fact. This is a safety hazard. When a security officer is confronted with a dangerous incident and they must open a report, scroll to the bottom, and open the camera app before taking a pic, there is a problem! And that is just one of many bugs that the largest security guard company patrol software app providers have had for ages. We operate by the “Keep It Simple Soldier” principle in the development of our guard company patrol software system. Click here to DEMO. So then, a simple, effective, affordable, real-time guard patrol software app, for real-time situational awareness, is the solution. 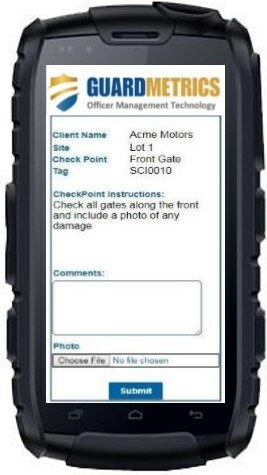 Your officers need to get you the intel you need–scanning patrol checkpoints and submitting mobile reports–quickly and safely, so that your security guard company can receive professional patrol reports and incident reports, with attached pics and videos, and branded with your company logo, to your stakeholders as soon as possible. And you need to be able to easily create new reports, add officers and clients, create and assign new post orders, and track your officers in the field with a simplified guard company patrol monitoring system; both for the reporting accountability needs of your clients and for the accountability to the safety of your officers. 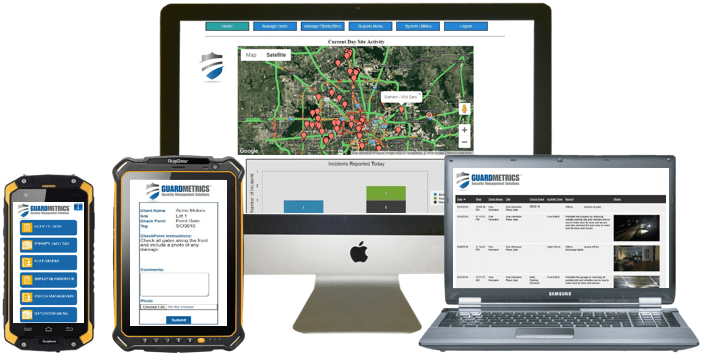 Call GuardMetrics today for a simple, efficient, affordable solution to your guard company patrol software needs.